14. Easy operation, installation and maintenance. 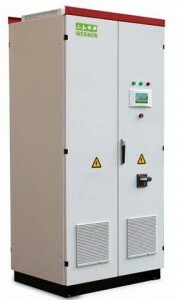 EA100KTF inverter is a PV grid-connected inverter used in PV system. It can make the PV arrays supply most power and convert the power to the utility grid. The grid-connected PV system consists of PV arrays, photovoltaic combiner box, photovoltaic grid-connected inverter, metering devices and utility grid.